John Finnie at the Clachnaharry railway bridge. Picture by Sandy McCook. Plans to stop budget travellers sharing cabins with strangers on the Caledonian Sleeper have been condemned by a north MSP. 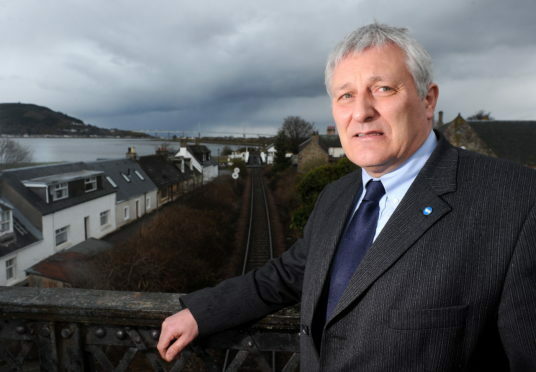 Highlands and Islands Green MP John Finnie has raised concerns with the Scottish Government. However, the politician welcomed the decision by Serco, the operators of the Caledonian Sleeper Service, to put its decision on hold, although it is planned for later in the year. The operator announced it planned to make all passengers travelling alone pay for their own cabins, a system already in place for people sitting in first class. It would have meant fares rising by two thirds, from a minimum of £85 to at least £140. Serco had intended making the changes this month, but has now postponed its plans until the first of a new fleet of trains start running in October. Mr Finnie said: “Serco have been high-handed in the manner in which they have sought to alter their fare structure in respect of budget travellers, not travelling together, sharing a cabin. “Their profit-driven proposal ran contrary to previous undertakings and Serco were taken to task by campaigners for that and right to reverse their decision. “Sadly, it seems that, contrary to their position at the time of the franchise agreement that the new sleeper would be ‘an iconic Scottish journey available to all from backpackers to business travellers’ Serco say they now want to run an exclusive hotel on wheels. Serco also operate the North Link Ferries to Orkney/Shetland, where up to four people routinely share cabins. A spokesman for Serco said: “We are modernising the Caledonian Sleeper to ensure it meets the demands and needs of travellers today and in the future. “This not only involves the introduction of new trains, due later this year on a phased basis, but also a range of new product types including rooms with en-suites and double beds.